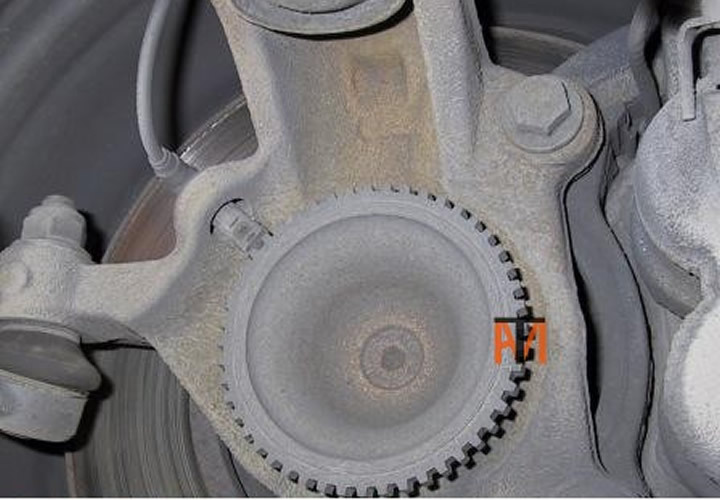 This indicates a fault with the Anti-locking Braking System. You can drive the vehicle but the ABS might not work. Can also come on if the alternator is not charging properly. Click here How To Test Alternator Charging System You will need EOBD diagnostic equipment to find cause but it is worth checking wiring and sensor for damage see below. Note if this light is on it will fail the MOT. Check wiring to sensors for damage particularly N/S as there is more chance of debris in the gutter that may have damaged the wires or sensor. See picture below of sensor and wiring, each wheel will have a sensor on rear of brake disc or drum, you may need to remove road wheel to check for damage.